I'm a highly irrational person with no sense of proportion or decency. 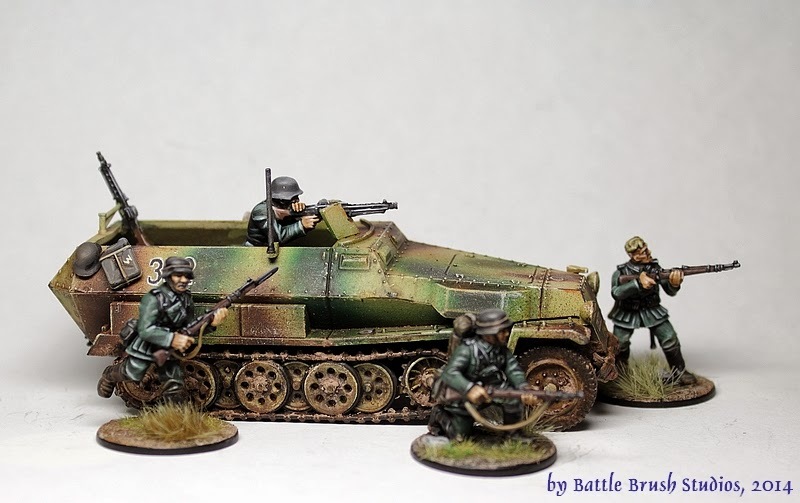 This is why I got myself one of those "German 500 points" deals from Warlord Games for Christmas (despite already have some other WW2 figures at another scale). 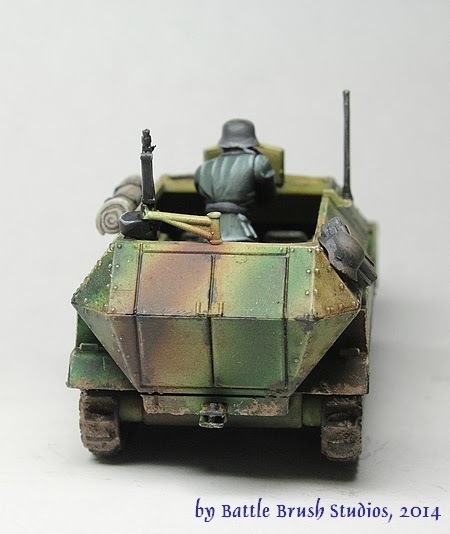 In regular terms this amounts to two infantry sections and five extra fellas, an MG42 medium machine gun team, a 81mm mortar team and a plastic Sd.Kfz.251 Ausf.C, one of Warlord Games' plastic vehicles they recently released. This is what I want to take a look at today. 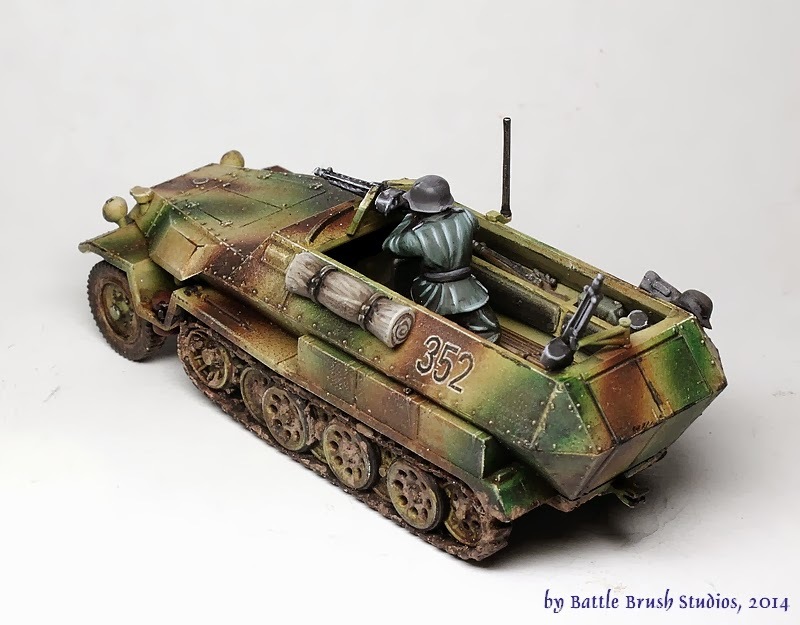 The Sd.Kfz.251 of course is one of those iconic vehicles of the war and in my mind one of the most visually endeering. 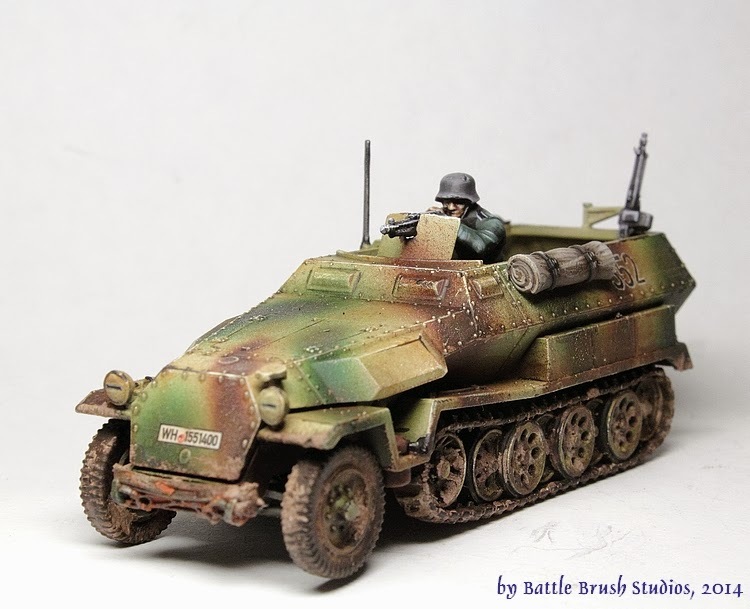 There were more than 20 different specialized vehicles based on the "Hanomag" (named after Hannoversche Maschinenbau AG, the company who first produced the chassis) and overall more than 15,250 vehicles were produced during the way which is an incredible number in terms of the Wehrmacht. 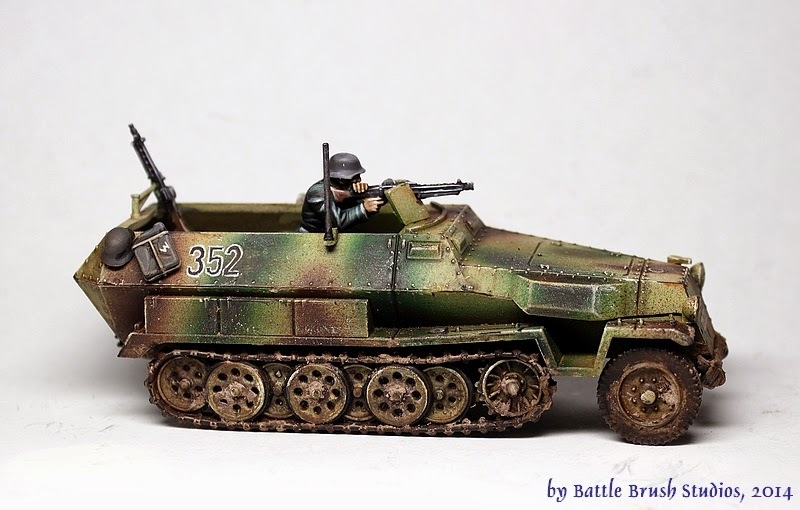 This version is the regular half track mittlerer Schützenpanzerwagen (medium armoured personnel carrier) Sd.Kfz.251 Ausf.C, armed with two MG, two seats for driver and radio operator and transport capacity of ten more soldiers. It was armoured all around (protecting against small arms fire and shrapnel) with open top and a door in the rear of the vehicle. 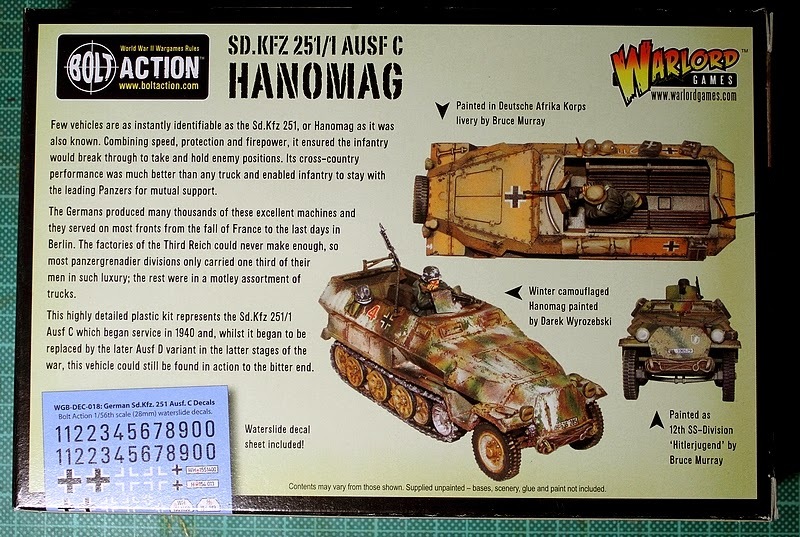 This kit is full plastic, the front of the box, as usual, shows a photoshopped picture of a painted model in nice surroundings. I really could do without the photoshopped effects but it's no dealbreaker for me. The back of the box has some more info on the vehicle and shows a few pictures from different angles. It also informs us that there is a waterslide decal sheet in the box. Very good. One detail I noticed once again: The pictures are of different paintjobs on the vehicle and with each of the pictures they put the painter's name. That's a good move. Now for the sprues in the box. They are in there loosely, no plastic wrapping involved neither around the box nor the sprues. 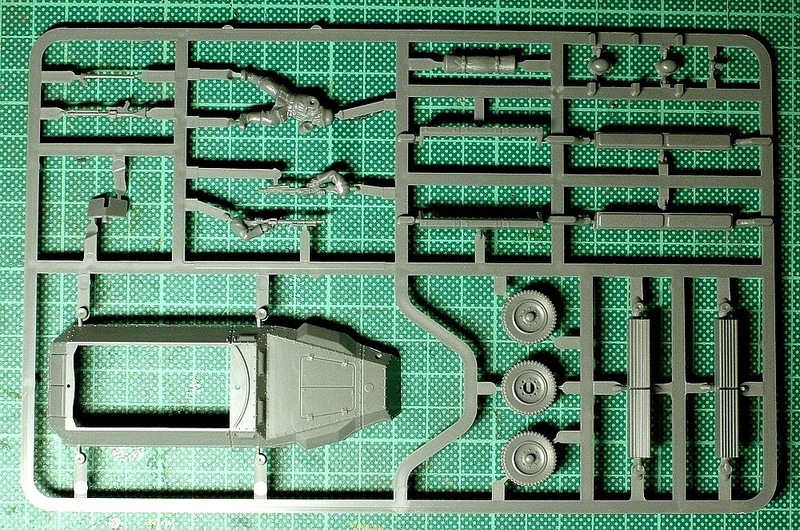 There are two sprues in the box. The plastic is of the already familiar quality, casting is nice as well. Again, this is not a scale model so the style is rather different to those. When I held the sprues in hand it felt like holding Warhammer 40k Rhino sprues. The main chassis consists of a three parts. Put in the seats and stowage compartments, two more parts for the tracks, head lights, add the front wheels and that's that. After that you can get into adding the MGs. With those you get to choose between MG34 and MG42, both are included in the box. Very cool. 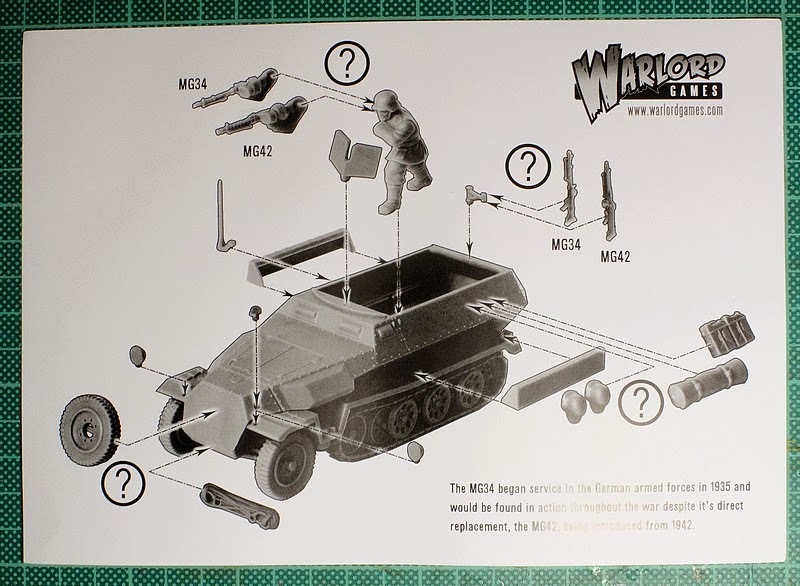 To top that off, we also get some wire rope, a spare tire, two helmets (slightly weirdly shaped, I suggest using the ones from the infantry boxes instead), four jerrycans and a rolled up tarpaulin. One thing I noticed during assembly - the bench parts didn't quite match up with the nubs on the inner side of the hull that indicate where the benches are supposed to go so I had to cut off one of those nubs on each side to make the benches fit right against the inner hull. 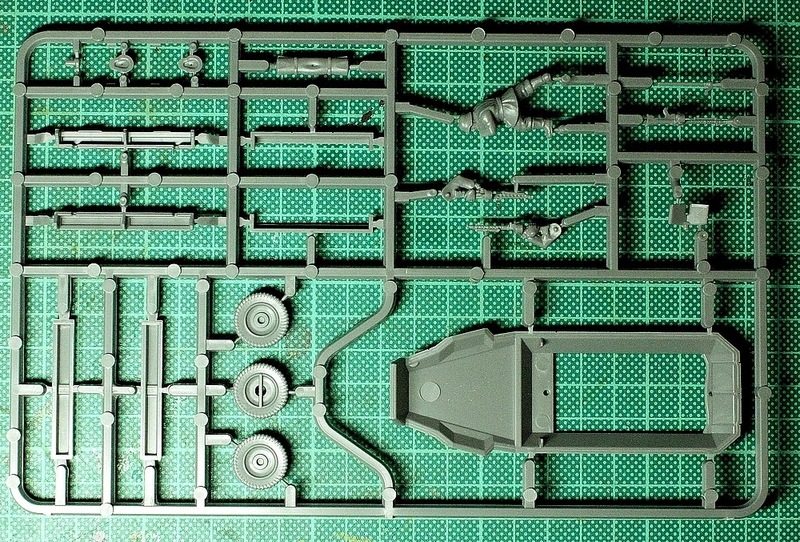 Also included you will find a gunner for the front MG which is a very nice touch. Unfortunately there is no driver or radio operator included. Some people reported trouble fitting the gunner's feet between the benches. I think that the problem is that the nubs on the hull not fitting with the benches leads to too narrow a gap between them to fit the gunner properly. ...and - above all - a decal sheet. Due to this kit being rather flexibe as to the time period it can be used in, the decal sheet has the earlier all white Balkenkreuz as well as the one with black in the middle, both in three sizes. 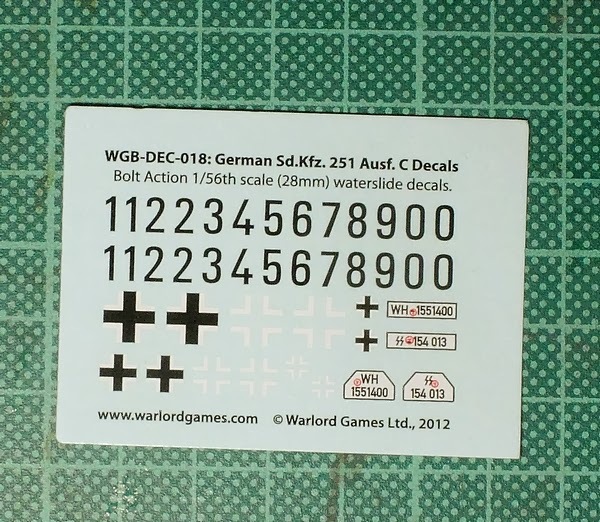 We also get number plates for Wehrmacht and SS vehicles and vehicle numbers. Very, very surprisingly the vehicle numbers only come in the all black variety which to my knowledge was rather uncommon. 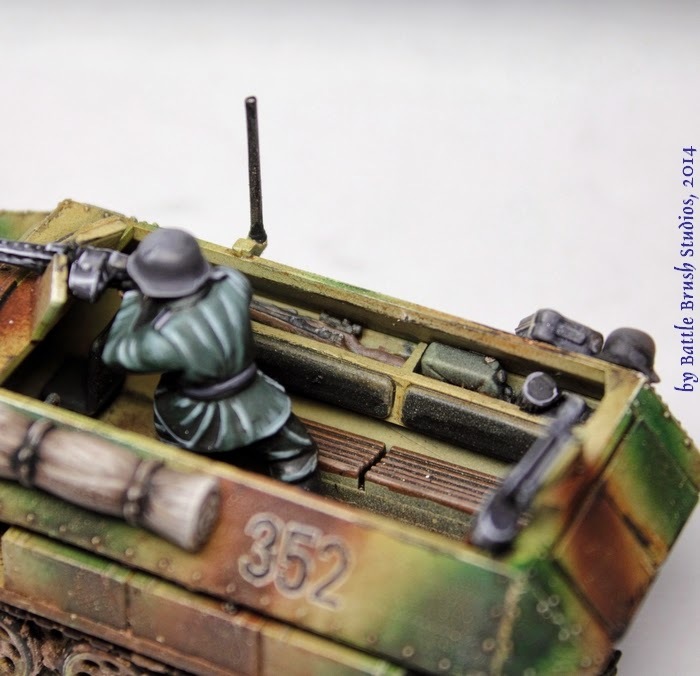 This is why I had to freehand white outlines for the numbers as I had done on the Panzer IV as well. As I said, the casting is pretty good except for the gunner on whom the casting quality is a bit lower. He very much looks like a "starter set figure", meaning two parts at the most, not too crisp details and the odd problematic undercut (specifically the left arm). Very happy with the additional stowage you get with the set. Because: Stowage = goodage. Or something like that. If you want to depict a combat vehicle on campaign you better have a lot of stowage on it, usually the more the better and the more realistic. This is also why I raided some weapons sprues for stuff to fill the stowage compartments behind the seats with. On one side we've got some rifles, a jerry can and some gas mask containers (no need for those really), on the other side some hand grenades, some rolled up blanket I made from paper and PVA glue and some more webbing and pouches.I suggest adding these things and painting the interior before attaching the hull top part or the gunner. Painting the model was fun. 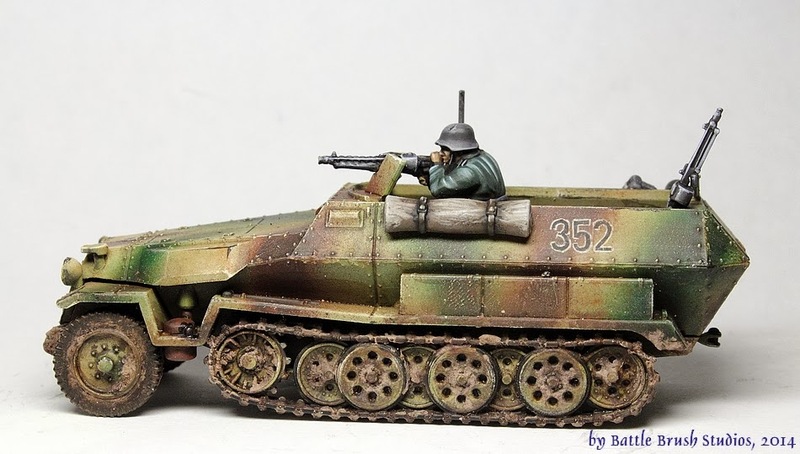 I did it along with the Panzer IV featured in an earlier review while I tried to make the camo look a bit more broadly applied than on the tank just to make it look a little different. Here it is now, all painted up and ready for the table! 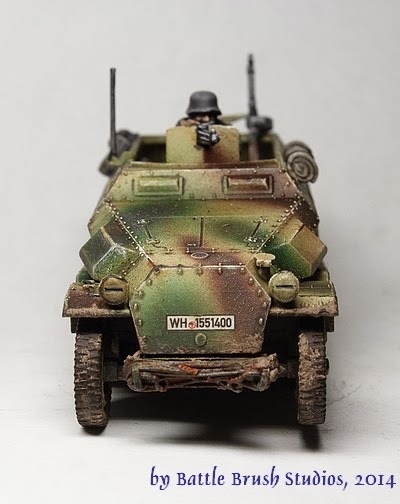 I kept the MG gunner seperate so I could use him for another LMG gunner if necessary (German Panzer Grenadiers do love their LMGs as you know). I should add some webbing for that too but for the sake of this review I thought it was better to keep him as he is in the box. So what do I think of the kit? Actually, there is nothing negative to report. The measurements are spot on, the quality is okay. 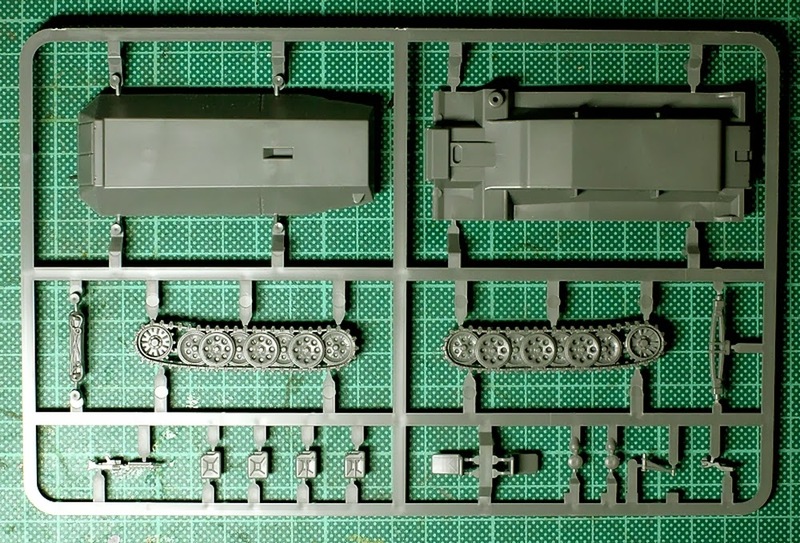 I commend Warlord Games on having added a decal sheet this time as well as that gunner, gun options and additional stowage. 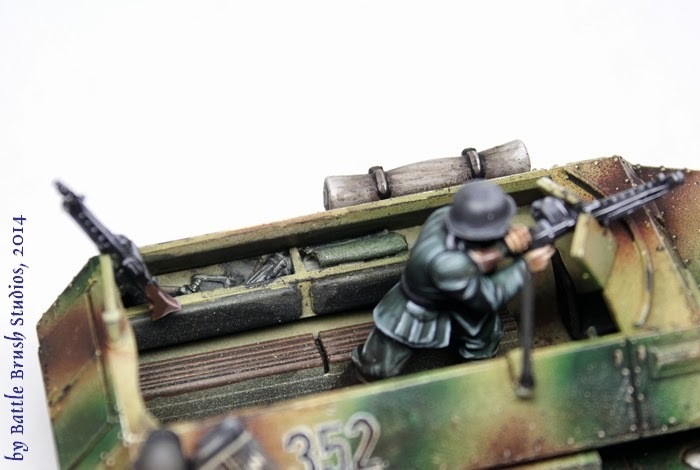 At £15.00 a pop this one certainly is worth a look and surely a highly welcome addition to any 28mm German WW2 collection. 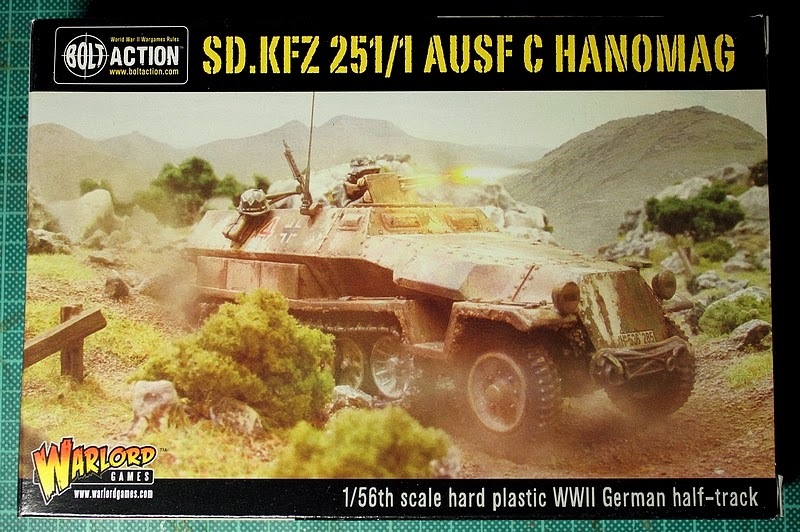 There is one thing though - if I was to buy this kit on its own I think I would rather go for Warlord Games' Sd.Kfz.251/10 set. 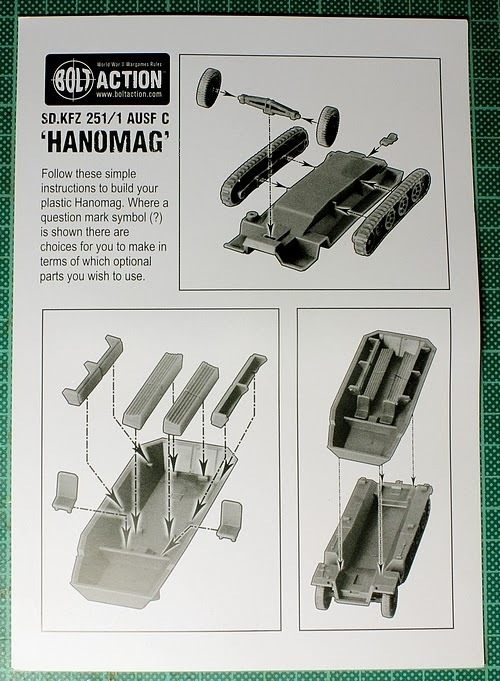 It seems to have everything the Plastic Hanomag set has plus two crew figures including head options and a PaK37 for just £3.00 more. Worth a thought. 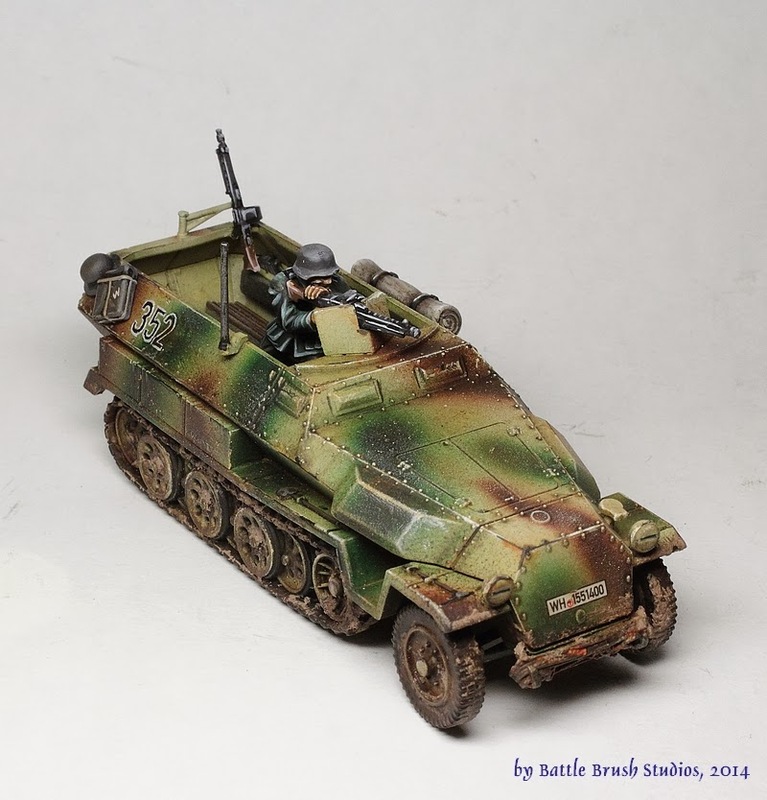 Anyway, this surely is the most affordable 28mm Sd.Kfz.251 on the market, a breeze to put together and has a nice selection of additional options. The only downside I see is the weird numbers on the decal sheet. 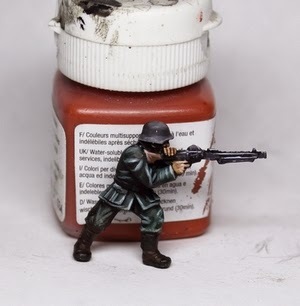 Don't forget that any WW2-themed painting/modelling project commissioned during all of December is -20% off! - Extended until January 17th! !